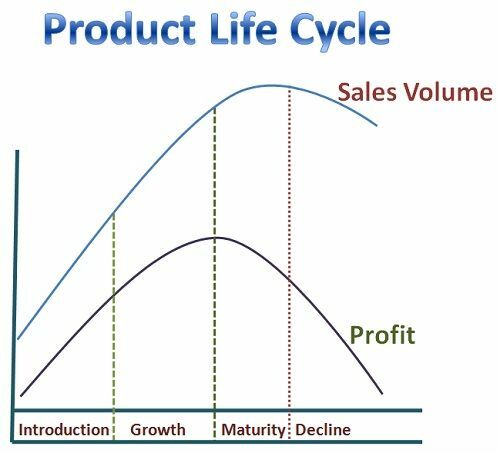 Definition: The Product Life Cycle means the sequence of stages that every product progresses through until it reaches the stage where it is finally abandoned or discontinued from the market. In other words, the life of a product is finite and advances through several stages i.e. from the introduction to growth, maturity and decline which are associated with the changes in the marketing situations and hence the marketing strategies and the marketing mix also get affected. Introduction Stage: This is the stage when the product is very new to the market, and the firm tries to create product awareness and develops a market for the product. This stage requires greater investment as the product branding, and quality levels are established, and the property rights such as patents and trademarks are obtained. The firm can either keep the price of the product low to penetrate into the market and increase its market share or price the product on the high side to recover the development cost. The blend of advertising and personal selling is likely to be more effective at the introduction stage since the product is new and the customers will make purchases only if they have sufficient information about the product. Until the consumers show the acceptance for the product, the firm distributes its product through a selective distribution channel. Growth Stage: This stage is characterized by increased sales and profits. As the production increases the firm achieve the economies of scales and hence the overall profits of the firm increases. Here, the firm tries to develop the brand preference and increase the market share. This is the time when other similar kinds of goods enter the market and thus, the firm tries to maintain its quality and introduce add-on features and support services to keep up with the market share. Here the competition is not so stiff and, therefore, the firm keeps a moderate price of its product and enjoys the increasing demand. More distribution channels are added to the network as more and more customers are to be reached. Since the customer base is widespread, the broader promotional tool is required and hence the advertising is likely to be more effective. Maturity: This stage is characterized by slow growth and intense competition. There are several firms that offer similar kinds of products and therefore, the new product model or its variants are introduced to differentiate it from that of the competitor’s product. Here, the distribution becomes more intense, and the channel partners are often given the incentives to gain more preference over the competitor’s products. The sales promotion and personal selling play a vital role at this stage. The short-term incentives are given to the public in the form of gifts, vouchers, discounts, rebates with the intent to boost temporary sales. Maintain the product by adding new features or discovering its new usages. Harvest the product by reducing the cost of production and selling to the niche market segment. Abandon the product i.e. discontinue or withdraw the product from the market or liquidating inventory to another firm that is ready to continue with the product. Thus, these are the stages which every product passes through, and the company should plan its marketing strategy keeping in mind the life stage of a product in which it falls.